Updated July 14: The Internet-Wide Day of Action to Save Net Neutrality on July 12 enjoyed a healthy turnout.Thousands of companies and some visible tech celebrities united against the FCC proposal called Restoring Internet Freedom, by which the new FCC chairman Ajit Pai hopes to loosen regulations for the ISPs and telecom companies that provide Internet service nationwide. The public has until mid-August to give comments to the FCC. The protests took many forms. Organizations including the American Civil Liberties Union, Reddit, The Nation, and Greenpeace placed website blockers to imitate what would happen if the FCC loosened regulations. Other companies participating online displayed images on their sites that simulated a slowed-down Internet, or demanded extra money for faster access. 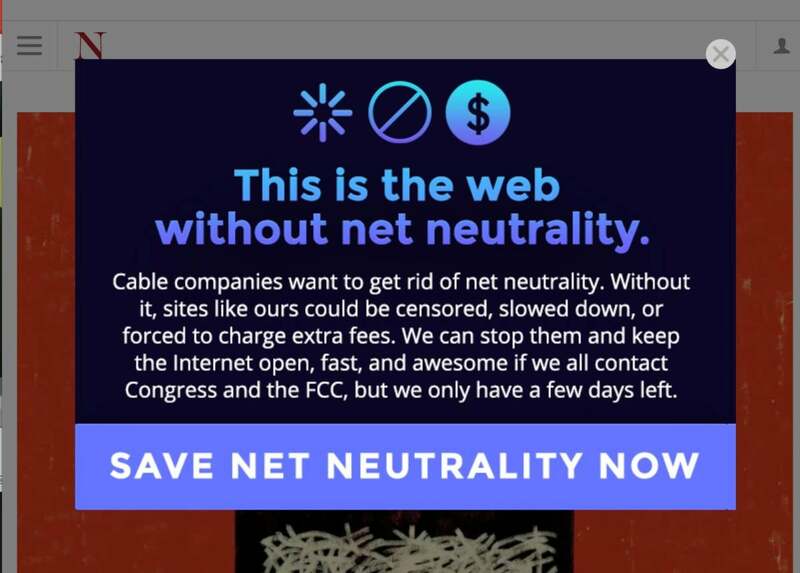 For the July 12 Internet-Wide Day of Action advocating net neutrality, sites including The Nation displayed images showing people what the web would be like if corporations operated it for a profit. 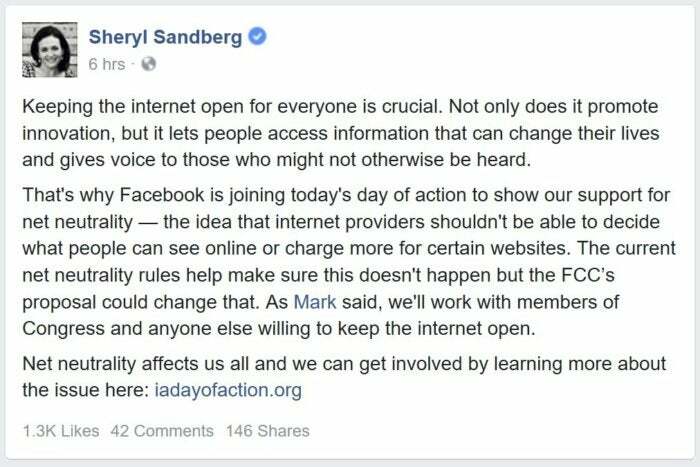 Facebook COO Sheryl Sandberg posted to her page about net neutrality as part of the July 12 Internet-Wide Day of Action. Facebook joined in with Sheryl Sandberg posting her message on Facebookas well as Facebook CEO Mark Zuckerberg.“Keeping the internet open for everyone is crucial. Not only does it promote innovation, but it lets people access information that can change their lives and gives voice to those who might not otherwise be heard,” Sandberg said. Sen. Ron Wyden, D-Ore., and Sen. Brian Schatz, D-Hawaii, wrote a letter to the FCC Tuesday – one day early — to make sure the FCC’s system was ready to withstand a cyberattack, as well as the large volume of calls expected Wednesday. 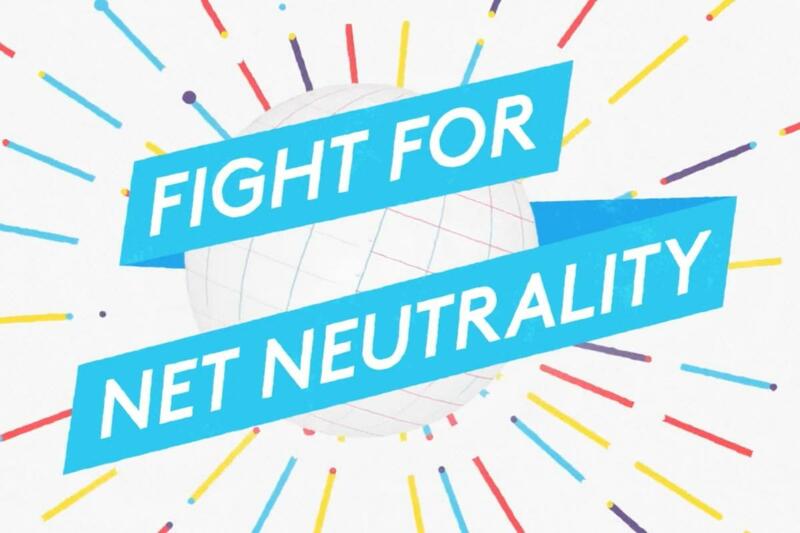 The July 12 Internet-Wide Day of Action strove to highlight how the web would look if telecom companies were allowed to control it for profit. Organizing groups such as Fight for the Future, Free Press Action Fund, and Demand Progress want their actions to call attention to the potential impact on everyday users, such as having to pay for faster internet access. Where net neutrality stands: Under the Open Internet Order enacted by the FCC in 2015, internet service providers cannot block access to content on websites or apps, interfere with loading speeds, or provide favoritism to those who pay extra. However, FCC Chairman Ajit Pai, selected by President Trump in January, has been advocating a completely open internet, where the ISPs could control access or charge fees without regulation. A Senate bill that would relax regulations, called Restoring Internet Freedom (S.993), was introduced in May and was referred to the Committee on Commerce, Science, and Transportation. What this protest is for: The July 12 protest, which organizers are calling the Internet-Wide Day of Action to Save Net Neutrality, will fight for free speech on the internet under Title II of FCC’s Communications Act of 1934. On that date, websites and apps that support net neutrality will display alerts to mimic what could happen if the FCC rolled back the rules. Who will come together for the protest: More than 180 companies including Amazon, Twitter, Etsy, OkCupid, and Vimeo, along with advocacy groups such as the ACLU, Change.org, and Greenpeace, will join the protest and urge their users and followers to do the same. Where the protest will take place: Sites that support net neutrality will call attention to their cause by simulating what users would experience if telecom companies were allowed to control web access. Examples will include a simulated “spinning wheel of death” (when a webpage or app won’t load), blocked notifications, and requests to upgrade to paid plans. Organizers are also calling on supporters to stage in-person protests at congressional offices and post protest selfies on social media with the tag #savethenet. Who opposes the protest: FCC Chairman Ajit Pai and large telecom companies, such as Verizon and Comcast, want to relax net neutrality rules. Some claim that an unregulated internet will allow for more competition in the marketplace, as well as oversight of privacy and security measures. Why this protest matters: The July 12 protest is projected to be one of the largest digital protests ever planned, with more than 50,000 people, sites, and organizations participating. If successful, it would be reminiscent of a 2012 blackout for freedom of speech on the internet to protest the Stop Online Piracy Act and the PROTECT IP Act, and an internet slowdown in 2014 to demand discussions about net neutrality. Copyrights © 2019 Smartanddigital | All rights reserved.